He’s an incredible player. One-on-one, there is not many better players. You wonder how he would go against the all-time greats, in Wayne Carey and all those type of players. It’s funny, the ball gets kicked to him in a one-on-one contest and I actually breathe easy thinking ‘he’s going to win it’. He’s an incredible player. We are very lucky to have him. 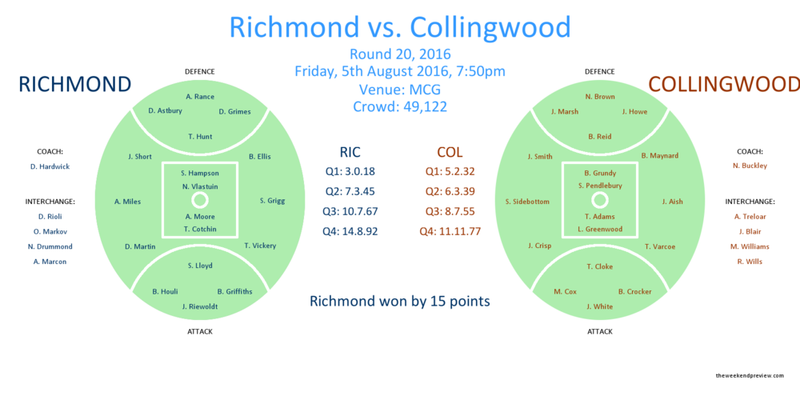 The 2016 Round 20 clash between Richmond and Collingwood was a tense hard-fought battle between two traditional rivals. But for two teams that were out of finals contention, the match could easily be considered to have had little wider significance. But in hindsight, it was probably Richmond’s most important win of the year and possibly saved the club from falling into complete anarchy that in all likelihood would have thwarted the success they achieved in 2017 and quite possibly resulted in Dustin Martin being in a Kangaroos jumper in 2018. We are absorbed in building a strong and bold premiership club and we'll leave the political manoeuvring to others, as we can't afford to be distracted about the serious business we have to do. After coming this far, are we going to walk away from the challenge of taking that next big step on our road to the pathway of success? Or are we going to hand over the club and say it's all too hard? No we're not, not on my watch. Stability has been important and it has been a key to our performance on and off the field in recent years. Stability and change go hand in hand, stability allows change. Instability and change breeds chaos and I refuse to let that happen to this club. This is a very different club than it was four years ago, much less what it was 10 years ago. While the ultimate prize has eluded us, the trajectory is absolutely clear. Richmond won the match, Hardwick kept his job, the board survived a challenge and the Tigers ultimately achieved the greatest success of all 12 months later. Peggy O’Neal was ultimately vindicated. Alex Rance was given the best-on-ground by the umpires for his performance that included 26 disposals, 10 marks (2 contested), 9 Rebound-50s, 7 one percenters and 10 intercept possessions. As the pre-eminent defender of his generation, Rance has only received the 3 Brownlow votes in 3 of his 180 AFL games to date. This may seem insufficiently small, but for a Key Defender, 3 best-on-ground performances (as judged by the umpires) is quite an achievement. To provide context, in the 198 home & away games in the 2017 AFL season, only 2 Key Defenders were given 3 votes on Brownlow Night – Tom McDonald in Round 6 against Essendon and Liam Jones in Round 15 against Adelaide. Intercept Possession: Any possession that is won that breaks an opposition chain. One Percenters: A knock-on, spoil, smother or shepherd. The interesting thing about the above two statistics is that they represent two distinctly different skills. The intercept possession highlights the ability of a player to read the play and create turnover opportunities. The one percenters on the other hand highlights the ability of a player to do the selfless team acts that the coaches and teammates love. The ultimate key defender therefore is the player who can combine both these attributes. We therefore could combine these statistics to develop a metric, Key Defender Points, to identify who is the best Key Defender in the AFL and provide them the recognition they deserve. Figure-2 presents the Key Defender Rankings after Round 5 of the 2018 season. Note, all players in the AFL are eligible to be included in the rankings, but it just so happens that the leader board is almost exclusively key defenders. In addition, in order to make it onto the leaderboard, a player must have played at least two-thirds of the season, which after 5 games precludes anyone who has played 3 games or less. 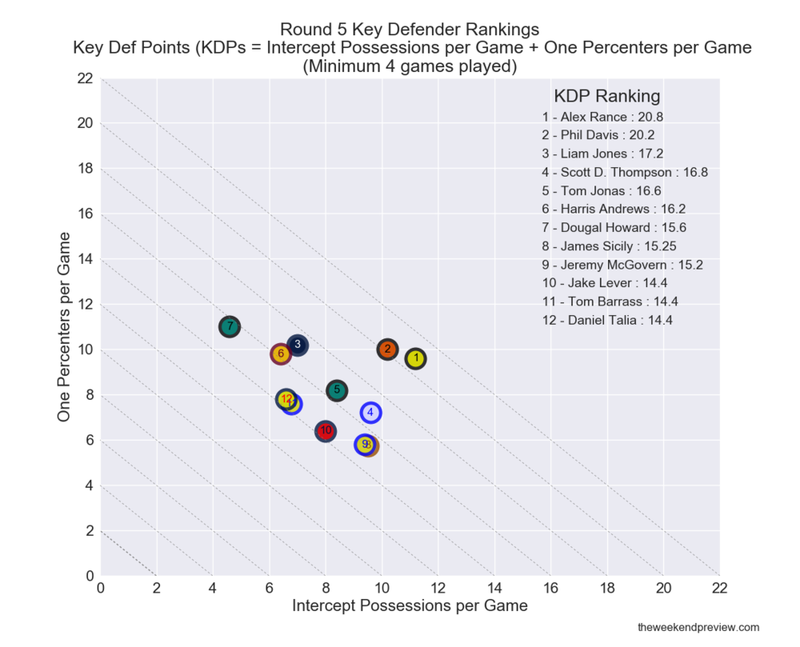 The diagonal dashed lines on the graph represent the player’s KDP value, with the further the player is positioned to the top right hand corner of the figure, the higher their KDP value. After 5 rounds of the season there are 2 standout players, Alex Rance and Phil Davis, who are over 3 KDPs greater than any other player. But at this early stage of the season, Alex Rance can still claim to be the best Key Defender in the AFL with his 0.6 KDP lead on Davis. The rankings will be updated each week until the end of the home & away season (link), at which point the best Key Defender in the AFL will be crowned. Richmond can consider themselves extremely lucky to have the asset that is Alex Rance. 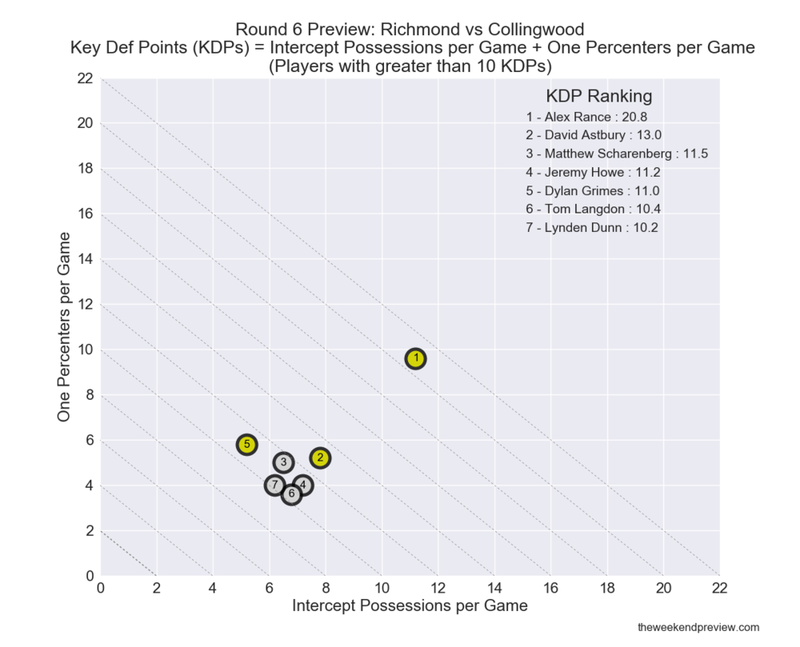 Figure-3 presents the KDP Rankings from all Richmond and Collingwood players that have played a game this year. Collingwood have 4 capable players in Matthew Scharenberg, Jeremy Howe, Tom Langdon and Lyndan Dunn who average greater than 10 KDPs per game, but there is daylight between them and Rance. Rance is supported well by David Astbury and Dylan Grimes but it is difficult to imagine the Richmond defence being as capable as they are in restricting opposition teams from scoring without the constant presence of Alex Rance. In fact, Rance hasn’t missed a game since Rounds 6 and 7 of the 2016 season (games which Richmond lost). And for a team such as Collingwood, for which their biggest weakness remains their forward line, the towering presence of Alex Rance is difficult to ignore. Collingwood has been impressive over the past few weeks, but unfortunately for the Magpies, so has Richmond.